My choice for those who prefer a more sheer, light weight approach to foundation. Although light in texture it can be applied in layers to up the coverage level without feeling heavy nor will it cake. The foundation itself is a gel-cream hybrid, if you have tried Mac Studio Sculpt then you will understand as the consistency is very similar, the light texture makes it great for the Summer months. I find this keeps oil at bay rather well without drying out my skin and has a natural almost dewy like finish. It wears well even in humid weather, personally when wearing this foundation I don't powder my entire face as it has great oil control, rather I only lightly dust my problem areas and leave the rest as is. Being oil free it is fabulous for problem skin, oil can irritate the skin and produce blemishes not to mention block pores so once that is eliminated you in turn reduce such problems. If you want a perfectly matte base, that almost look airbrushed then this is the foundation for you. I kid you not when I say it is almost weightless. You can apply several layers of this product should you wish and it will not cake nor does it feel heavy on the skin which could make it ideal for the upcoming summer months. Being so lightweight you wouldn't expect it to offer great coverage but it truly does. I feel medium coverage is under selling this foundation as it covers more than any other medium coverage foundation I own and yet it is not quite full coverage...it is somewhere is the middle for lack of a better term. Lancome Teint Miracle Foundation covers any redness, discolouration, dark circles and most other skin concerns but you may want to add a dab of concealer to blemishes. It glides on like a second skin and settles to a semi-matte finish that looks both soft and natural, not to mention it doesn't sit in enlarged pores or lines of any kind. The great thing about this foundation is the wear time on my oily skin it doesn't budge or become shiny throughout the day - I'm talking a good 10 hours of wear with ease. The downside of this is that it does have quite an alcoholic fragrance which my guess is due to it being an ingredient so those with dry skin may want to avoid it! A foundation that is perfect for evening wear is not always all that easy to find. You want it to withstand the heat of a club not to mention some manic dance moves (okay maybe that is just me) and to look great in photographs? Well for all of those reasons I recommend Make Up Forever High Definition Foundation. This features a light almost watery texture that doesn't suggest that it will offer great coverage but boy it does. Officially it is noted that this is a medium coverage foundation but in my opinion it is closer to being a full coverage without being heavy on the skin. This is one of the few foundations that I have found offers flawless coverage in a full proof way. You can apply it with your fingers, a sponge, a brush or even a beauty blender the end result is always the same - smooth, natural, semi-matte finish that covers most if not all skin faults. The finish is semi-matte and very natural - it doesn't leave the skin looking flat or mask like but it can be built up in needed without caking or again looking heavy. Make Up Forever High Definition Foundation won't nestle into open pores, fine lines nor will it cling to dry areas and as it is a silicone based formula those with normal to dry skin won't require a primer. It is worth mentioning that being a HD product this has been created with cameras in mind meaning it is perfect for flash photography without the dreaded flashback effect hence why I keep it for special occasions. Annoyingly it is not all that easy to track down in the UK but the good news is that Sephora now ship to the UK! One of the best budget foundations I have ever used is Maybelline SuperStay Better Skin Foundation, from first application it was nothing but love. In terms of texture it has a second skin like quality, slightly powdery finish and loose texture which may draw comparisons to the likes of Armani Maestro Foundation. The main difference (price aside of course) is that this sits so much better on my skin - it doesn't separate under the stress of my oily t-zone nor does it cling to any dry patches. Rather it glides on to the skin and creates the most perfect almost air brushed effect with no effort what so ever. I truly feel that Maybelline SuperStay Better Skin Foundation should be marketed as a 3-in-1 foundation : it disguises my enlarged pores much like a primer would, offers medium to high buildable coverage without caking or appearing heavy and lastly has a gentle matte soft focus powder finish once settled into the skin. Multi-tasker? No this is the all in one foundation I have been dreaming off - I can quickly apply it and don't have to worry about putting in groundwork. Bye bye primer, powder and concealer! Okay if I have a long day ahead I will finish with powder and apply concealer to my under eye but that really is it. The shade range could do with expanding but it is a great little, long lasting buy! I don't just recommend this for oily/combination skin but I personally feel like everyone should try it out at least once. I adore this foundation. Bourjois Healthy Mix Foundation is one of the few gel formulations that works rather well with my oily skin. It glides on with such ease giving a flawless base with the illusion of a healthy glow despite how tired I may be feeling and stays put all day with a quick dab of pressed powder. Even if my skin does decide to have an oily moment the fresh, dewy finish of this foundation disguises it better than any other. I love it, my skin loves it, my purse loves it and it never fails to gain a compliment or two if you have yet to try it you simply must. Okay this has yet to launch but promise me that once it does you'll test it at the counter?The texture is light yet creamy, initially this worried me having oily skin but once blended on to the skin it is weightless yet covers exceptionally well. At the moment my skin is abysmal, I have large blemishes all along my jaw line and yet I can skip concealer with this foundation. It doesn't cake, oxidise nor does it look heavy. Yes this is a radiance boosting formula but there is not a shimmer particle insight, rather it brightens and lifts the complexion and settles to a natural matte finish. It isn't dewy nor is it flat just somewhere in the middle. I do have to warn that although this is long wearing and fairly transfer resistant on the really oily areas of my face (t-zone) this does become really shiny after around 6 hours of wear even with a primer and powder combo. I personally don't find this to be a problem as a quick dusting of powder and the problem is eradicated, I do however know that for some this well be less than ideal. For the rest of my face cheeks, chin et al the wear time is closer to 10 hours again with a primer and face powder. Shine aspect aside I can not fault this foundation and as you can read above it does contain amino acid pigments to ensure hydration so even the driest of skin types should be able to use this foundation. It also contains an SPF15 and Clarins Anti-Pollution Complex to protect the skin from city living and general pollution. Gah I love it! It should launch this coming August. I will be honest and say that this is my least favourite foundation of the bunch, if like myself you are prone to touching your face then I say leave this well alone as it does transfer really easily as it has a silicone like aspect. As you can imagine being a full coverage foundation Tarte Amazonian Clay Full Coverage Foundation has a slightly thicker than usual texture. I liken it a little to Laura Mercier's Silk Creme Foundation in that aspect and much like Laura Mercier's offering a little of this foundation goes a long way. If you apply to much be warned that Tarte Amazonian Clay Full Coverage Foundation will cake and look heavy, I fully recommend using a pea sized blob dotted over the face before buffering into the skin using the provided brush. This is a fairly creamy and as a result moisturising foundation that oddly doesn't contribute to the excess sebum on my t-zone but rather it keeps it under control. It easily covers all blemishes, discolouration and leaves the skin completely matte if a little flat so be sure to have a good blush and highlighter to hand. It doesn't settle into my open pores and I can't imagine that it will gather into fine lines either or cling to dry skin either. Tarte claim that this will wear evenly for up to 12 hours and in my instance that is an exaggeration, with a primer and powder duo I achieved a good 8 hours but signs of oil did creep in around the 9 hour mark. All in all a good matte, full coverage foundation that is comfortable to wear but I will be honest I do think it is a little on the pricey side. Do you have any foundations recommendations for oily/combination skin? I would love some new suggestions. 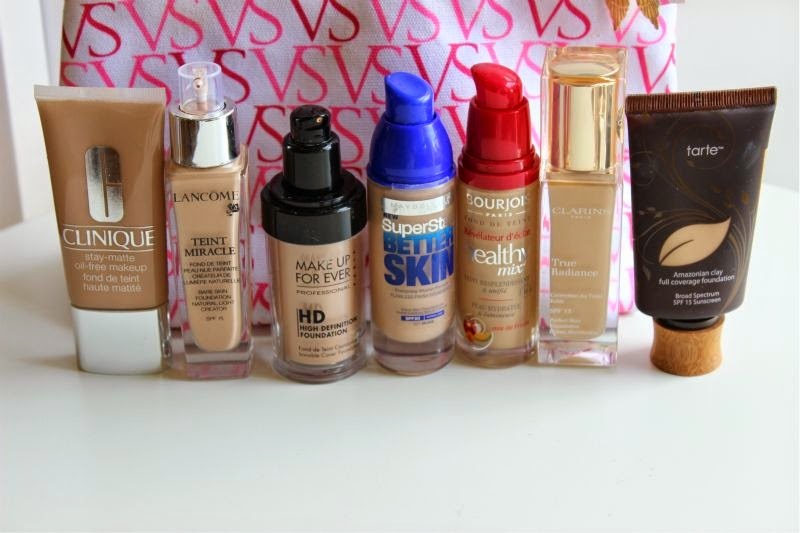 Great list, I also like loreal true match foundation for my oily skin! really helpful, I love the bourjois healthy mix foundation!